So many people devoted serious time this weekend to acquiring gifts for family, friends, and strategic acquaintances. Hopefully, each of you found time to give yourselves the gift of a decent bird sighting or two. I tried to rustle up some Short-eared Owls down at Nations Road, a notorious haunt for these magnificent beasts. Curse my rotten owl luck, I didn’t see a single one, but did manage a pale Rough-legged Hawk. Corey’s Best Bird of the Weekend was a surprise at Shu Swamp while participating in the North Nassau Christmas Bird Count. 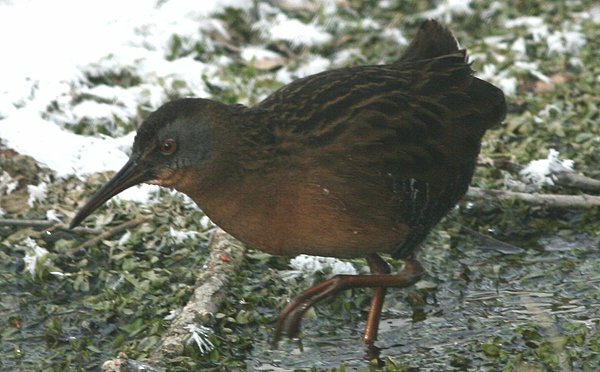 He’d heard reports of Virginia Rail being present there in winter but was amazed when one responded to a recording! Rails are awesome and an unexpected rail (like the one pictured above that overwintered in Rochester) in winter is even better. A Purple-crested Turaco fight! I forgot how nimble they are. About four dozen Black-crowned Night Herons nesting or hiding in the reeds at Don Edwards wildlife refuge near San Jose, California.